According to research published in Science Advances, enzyme inhibitors apparently promote healthy hair growth, potentially meaning a new safety-approved hair growth restoration treatment could be on its way. Researchers at Columbia University Medical Center in New York found that when hair follicles are suspended in a resting state, fast and healthy growth can be restored by constraining a family of enzymes inside the follicles. Hair follicles don’t produce hair on a constant basis but rather cycle between four resting and growing phases. At any given time, more than 90% of an individual’s hair is typically in the growing phase, “anagen,” which can last between two and six years. The catagen phase follows, which is when the follicles regress and move toward the surface. The resting phase is called “telogen” and “exogen” is the phase when hair falls out before the follicle resumes growth. The longer the hair, the longer the phases; long hair tends to grow slower. During experiments using normal mouse follicles and human hair follicles, Dr. Angela Christiano and colleagues discovered that drugs that inhibit the Janus kinase (JAK) family of enzymes promoted quick and robust hair growth when applied directly to the skin. The findings suggest that JAK inhibitors may be useful in restoring hair growth in various forms of hair loss, such as male baldness. To date, two JAK inhibitors have been approved by the U.S. Food and Drug Administration (FDA): one for treating blood diseases (ruxolitinib) and the other for rheumatoid arthritis (tofacitinib). Both are currently being tested in clinical trials for treatments of plaque psoriasis, alopecia areata (i.e. 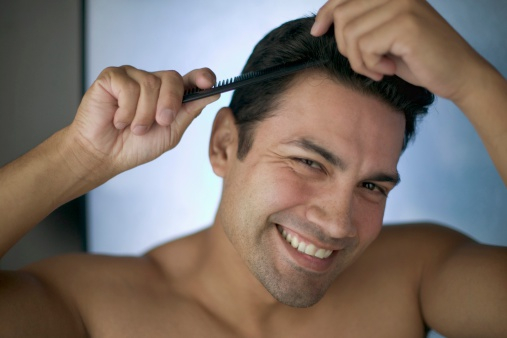 spot baldness), and autoimmune diseases that attack the follicles and result in hair loss. While studying alopecia areata, researchers discovered the effect of JAK inhibitors on hair follicles. During the experiments, researchers noticed that mice grew more hair when the drug was applied to the skin than when given internally. This suggested that JAK inhibitors may have an effect on hair follicles, in addition to inhibiting the immune attack. After a closer look at mouse hair follicles, researchers found that JAK inhibitors quickly awakened resting follicles out of dormancy. JAK inhibitors triggered the follicles’ normal reawakening process. Mice that received a five-day treatment with one of the JAK inhibitors grew new hair within 10 days, accelerating the hair follicle growth phase. Untreated control mice experienced no hair growth during the same time frame. In light of these new findings, researchers hope that the same result will occur in humans. Brazier, Y., “Drug promises robust new hair growth,” Medical News Today web site, October 23, 2015; http://www.medicalnewstoday.com/articles/301482.php. Yoram, M., et al., “Exogen, shedding phase of the hair growth cycle: characterization of a mouse model,” Journal of Investigative Dermatology 2002, doi:10.1046/j.1523-1747.2002.01842.x.